If you were to have a werewolf movie marathon you would obviously notice that each flick has it’s own werewolf look. Some of them look more human-like while other look more beastly, but each is unique. Here are a few different werewolf appearances. Make sure to check out the photo gallery at the bottom. Underworld: The crew on this movie did an excellent job in my opinion. It’s a perfect mixture of both human and wolf – not too much human, not too much wolf. An American Werewolf in London: The special effects team on this flick became huge due to having the best effects at the time. Not only the effects though, but the costumes and makeup were also a big hit. The werewolf in this movie looks a bit… odd, kinda like a monkey and a wolf had a baby. Still impressive though. Buffy the Vampire Slayer: Ok, I am a huge Buffy fangirl, I totally admit it, but the werewolves in Buffy were so laughable. Maybe if they didn’t run around like a kid pretending to be a puppy it would be a different story. The overall look was a super hairy human with a smooshed in face. 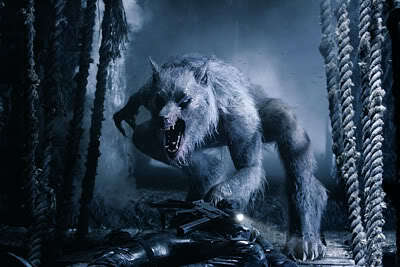 New Moon: This popular film went with the full on CGI wolf look, which I adore. They were beautiful giant wolves. Harry Potter and The Prisoner of Azkaban: Remus Lupin is probably one of the most adorable werewolves I have ever seen. He looked sorta like a hairier Gollum from Lord of the Rings. His look was a thin little beastly creature that stood hunched over. Blood and Chocolate: This is another one that went with the total wolf look, no human mix. The really cool thing about this movie is that they used real wolves, not CGI created ones like in New Moon. The result is a pack of stunning wolves to feast our eyes on. The Wolf Man: While the new Wolf Man looks awesome, I’m talking about the original 1941 Wolf Man. His look was a big afro, a pig nose and a bunch of patches of hair glued to his body. Not all that fancy, but hey, it was the 40s. And this ends my list, while there are countless werewolf looks they are all similar to one of these in some sort of way. Out of all the werewolf movies and shows out there which is your favorite? ‘The Pack: Winter Kill’ Novel and Contest!